I cannot remember where I stumbled upon this recipe…..so I apologize in advance to whomever it belongs to. I just know I C&Ped it as a word document and forgot to site a source! I think I was just overly excited! Could ya blame me???? I actually made them with my kids because they love helping me cook and bake. 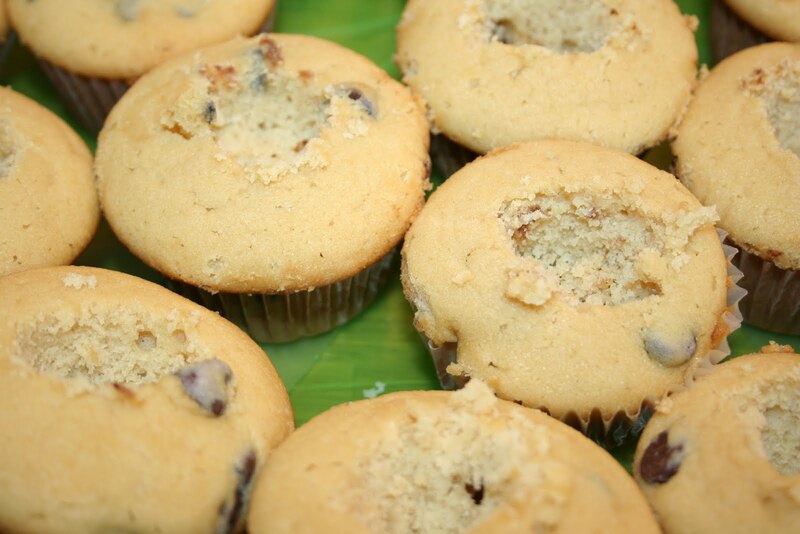 I didn’t give myself nearly enough time to make, bake, fill and frost them….so when you see the pictures…don’t judge! They are absolutely delicious…and the pictures DO NOT do these yummies any justice! I promise, next time I make them…..I will fancify them, and post better pictures! You have my word! They do take some time to make, so make sure you give yourself enough time, unlike me….and they will be well worth the time. They will have you at the smell of them cooking…then the taste of filling (you have to try it as you make it) and then the frosting (taste as you make..that’s my motto! )….and then by the first bite, you will fall in love…..
Preheat the oven to 350° . Line two cupcake pans with paper liners (24 total). Using the paddle attachment on your mixer, combine the butter and brown sugar. Cream together on medium-high speed until light and fluffy, approx 3 minutes. Add eggs one at a time, beating well after each addition and scraping down the sides of the bowl as needed. Alternating add the dry ingredients to the mixer bowl with the milk on low speed, beginning and ending with the dry ingredients, mixing each addition just until incorporated. Divide the batter evenly between 24 cupcake liners. Bake for 18-20 minutes, until a toothpick inserted in the center comes out clean. Allow to cool in the pan for 5-10 minutes, then transfer to a wire rack to cool completely. 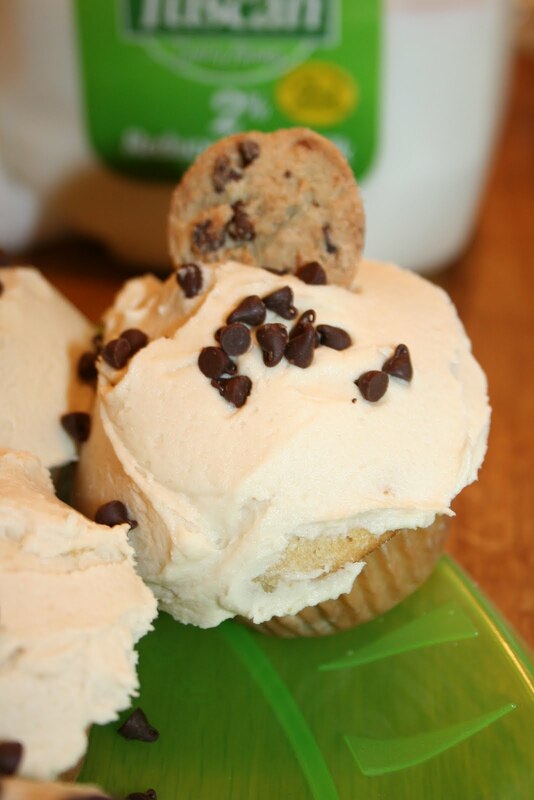 While the cupcakes bake and cool, prepare your cookie dough filling. Cream butter and sugar in a mixing bowl on medium-high speed until light and fluffy(approx2 minutes). Add flour, sweetened condensed milk and vanilla and beat until smooth. Cover with plastic wrap and refrigerate until the mixture has firmed up a bit, (approx1 hour). After cupcakes have cooled, fill the cupcakes by cutting a cone-shaped portion out of the center of each cupcake. Fill each hole with a chunk of the chilled cookie dough mixture. Beat butter and brown sugar with the paddle attachment on high speed until creamy and fluffy. Mix in the confectioners’ sugar until smooth. Mix in the milk and vanilla extract until smooth and combined. Frost cupcakes using a pastry bag –which as you can see…I did not, but plan on doing that next time…so they look fancier! I wasn’t going for fancy this time around! 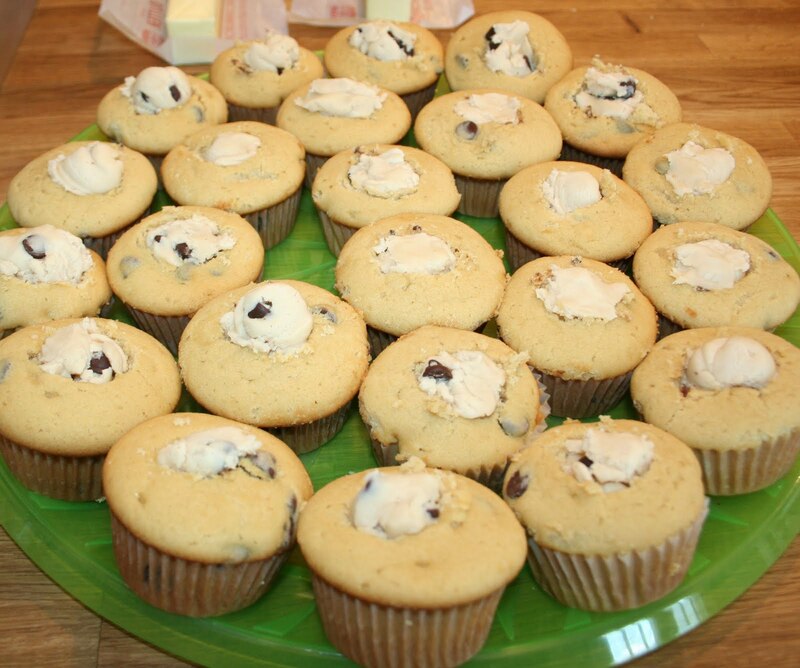 Decorate with mini chocolate chips and top with a mini cookie!